The Echinoblog: Why Sea Urchin sushi (uni) tastes SO frakking good! 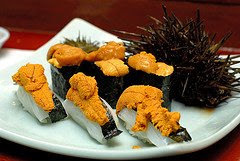 If you've ever enjoyed the fine diversity of Japanese cuisine, and are a serious sushi connaisseur (as I am) you have probably experienced the singular love of uni-a type of sushi made from the gonads (which produces the roe) of a sea urchin. To be sure, uni is not something everyone "gets" the first time they try sushi. But, for people who enjoy uni, they REALLY enjoy it. Its a compulsion to order it when they visit the sushi bar!! But why??? What are anandamides doing there in the first place?? These are actually naturally occuring chemicals in sea urchin gonads, which are thought to be important in the reproductive system, among other physiological/enzymatic processes associated with sea urchin fertility. Interestingly, (according to Wired)-some scientists have hybridized the euphoria-causing anandamides from sea urchins in conjunction with the psychoactive chemicals from marijuana in order to better study the endocannabinoid system, which is partly responsible for pleasure and pain signals. 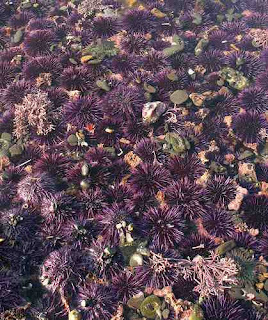 So far, anandamides have been studied in the N. Pacific purple sea urchin, Strongylocentrotus purpuratus and the European sea urchin Paracentrotus lividus. I've not tried uni from other species (the two other species,S. franciscanus and S. droebachiensis I believe are made into uni). Several species are fished in Australia. 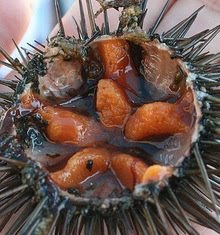 One wonders if the amount of anandamide and the perception of taste (and the "high"), varies per species..
That being said can sea urchins handle the fishing stress? 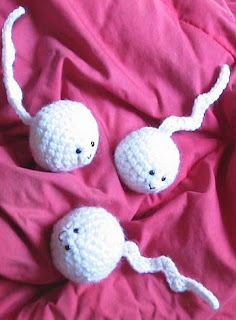 Incidentally, according to one of the papers I found, the chemical in S. purpuratus can reduce the fertilization capacity of sperm cells. This study was via direct application-not via ingestion, but if you are trying to be fertile, it probably doesn't hurt to lay off the uni, if you're having it every night! (plus uni is quite rich..so you probably can have too much of a good thing!!). That's interesting... reminds me of the low birth rate in Japan. Wonder if this could be one of the contributing factors? 1. they would have to be eating a LOT of it..and I don't think its that widespread. 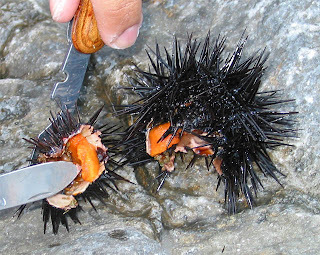 If this gets out - that you get a high from eating Uni - then the sea urchins on this coast might be doomed! Or become illegal. I simultaneously encourage you to satisfy your palette but also to be careful with appropriate species. Some tropical urchins are quite poisonous and I don't know if there's a relationship between degree of defense and flavor/toxicity/unpleasantness of their gonads. I over the course of the last few hours have consumed about 100 grams of uni using chopsticks sea salt and lemon zest in tiny amounts. What a sinful food that I love to indulge in every once and a while. AS far as getting high is concerned....maybe it' not just the taste I am craving! I just found out today that it's not actually the roe of the urchin it is the gonads...Non male or female specific kinda gonads...however this does not discourage me from enjoying it. They also have the world's greatest Abalone off Mendocino! I always joked that uni is like my own personal crack cocaine. No one else I know seems to like it, aside from a select few foodies I met online. I love that a local seafood shop here will CALL me when they get some in fresh. They're like my drug dealer! LOL! It's interesting to have scientific evidence to suggest it is acting like a drug when people eat it, albeit in small quantities. 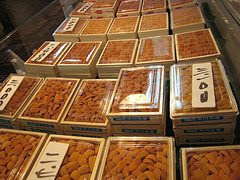 I used to live in Japan and I miss eating fresh urchin there quite often. I was spoiled. Now I gotta wait for calls from my 'dealer' to get more, hehe. I also enjoy it in pasta sauce. I wonder what species the Italians use in their culinary ventures? LOVE uni, first thing on my plate at every sushi bar. Honestly, I've never tried uni in Japan (never been to Japan). I hope to soon however! Uni is the absolute ly most horrible thing I've ever eaten. And I've eaten tons of weird foods. Don believe everything you read on the internet. Anandamide is is cacao as well. I wonder what the difference in quantity is between sea urchins and cacao. Hi Chris..just wanted to know which species are toxic to consumption..thnx..
Sea urchins are actually closely related to our ancestors, they have thyroid hormones that are the same as ours, its possible that those also give us a boost when eating them(the hormones survive the gut to be absorbed). Searched for sushi uni "literature". If you know of any please let me know. Especially curious if there are any in Japanese. Added Hokkaido to my bucket list. but "the stories about him are greatly exaggerated"
I tried uni at an excellent sushi restaurant tonight, and thought it tasted like animal hospital disinfectant. Am I missing something? @Thomas Schwartz it was probably some not so fresh uni... Its very bitter and funny tasting after a few days of it sitting around.. I was stung under my nails and in my foot by sea urchins in Mallorca, at the great Roc Illetas hotel. Having a simple lunch a bit later on our fifth floor balcony, I got the feeling of being alert, sharp, focused, receptive and emotional. I was very moved by the beautiful view of the Palma Bay, and tears came to my eyes from the beautiful spirit of the Mediterranean. I said to myself,” I must admit I feel a bit high, how can that be? Could it possibly be the sea urchins sting...? Nah, crazy idea. But I googled, and this sure was some surprise! The experience was very nice. But I had to have the small pins removed at the hospital some weeks later - the small particles moved outwards in my food, it seems. I was not badly stung, but they were still a nuisance. So I don't think I would let urchins sting me intentionally again, although it is tempting. Xyloplax pt. 1: Echinoderm Weirdness Extreme! The Friday Starfish Sing Along! Know your Grades of Uni! Ye Olde Haeckelian Phylogeny-Brisingids Rule!